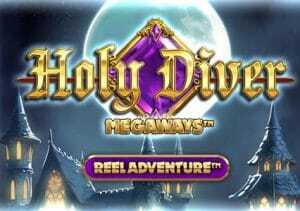 A cult concept album by an American heavy rock band is the unusual inspiration for Holy Diver MegaWays, a video slot from Big Time Gaming. Played using the shape-shifting 6 reel, game engine, the number of symbols on each reel changes with each spin. At their maximum they can offer 15,120 ways to win in the base game and an eye-watering 586,971 MegaWays in the Free Spins feature! Join a gallant knight on his quest for wilds, multipliers and free spins from between 10p and £20 per spin. The source material in Holy Diver MegaWays comes from US rockers Dio which tells the epic tale of a knight and his quest to reach the mysterious Sorcerer’s Castle. The knight is one of the main elements of this rather unorthodox game. He appears on a path underneath the 6 reel game machine. Standard Symbol Bonus feature – 1 of the A to 9 royal symbols is picked at random. All instances of this symbol on the reels above turn wild. A new payout calculation follows with the new wilds in position. Sword Bonus feature – land this and the knight’s sword becomes active. He can then use it to turn up to 3 reels wild. Those wild reels can come with multipliers of up to 7x. Multiplier wilds can combine here to offer potentially enormous boosts of up to 343x! Fireball Bonus feature – 4 flaming wilds are added. They can turn positions adjacent to them wild too. Gem Symbol Bonus feature – 1 of the higher value jewel symbols turns wild. Get lucky and you could see multiple gems turn wild on the same spin. A new payout calculation is then made. Holy Diver also comes with a Free Spins feature. You can activate this when you’ve collected enough gemstones in the meter to the side of the reels. Alternatively, you can carry on collecting until you’ve reached the next milestone. Take the spins immediately and you’ll receive 10 free spins. If you wait until the milestones are passed, then 2x and 3x multipliers come into play. The gallant knight continues his trek during the Free Spins feature. Instead of treasure chests, it’s diamonds that lie in his path. The first 4 times the knight reaches a diamond 1 extra free spin is added to you total. Once he reaches the fifth diamond, you’ll receive 8 extra free spins. The size of the reels can get enormous here. If all 6 reels reach their maximum, there are a possible 567,789 MegaWays in play. It might not be the flashiest looking MegaWays slot we’ve seen but it’s arguably the most unusual in terms of theme and backstory. The range of extras on offer here is pretty good too. There’s a nice variety to the features and the variance is high enough to keep you on your toes. You can win a whopping 23,306 times your bet on every free spin too. We won’t be investigating the Dio back catalogue off the back of Holy Diver MegaWays. It’s a surprisingly likeable video slot even if it is a little rough around the edges. I also recommend you try The Final Countdown which also is based on a rock band.